They're all gone. We remember them like yesterday: pieces of our stolen heritage. Things like NASA. Football. Parades and pies. Good things, comfortable things. We remember a time when we were alone in the universe, safe and oblivious. But it's all gone now. We called them the Telestines, and in the face of their ruthless invasion we were powerless. By 2040, all the world's governments and militaries had fallen, and the remnants of humanity exiled to the solar system. We looked down on our blue planet, so close to our birthplace, so close to our home. The year is 2650. Seventy-five years ago, an alien fleet attacked Earth. Without warning. Without mercy. We were not prepared. Hundreds of millions perished. Dozens of cities burned. We nearly lost everything. Then the aliens abruptly left. We rebuilt. We armed ourselves. We swore: never again. But the aliens never came back. Until now. With overwhelming force the aliens have returned, striking deep into our territory, sending Earth into a panic. Our new technology is useless. Our new ships burn like straw. All our careful preparations are wasted. Now only one man, one crew, and the oldest starship in the fleet stand between the Earth and certain destruction: ISS Constitution. 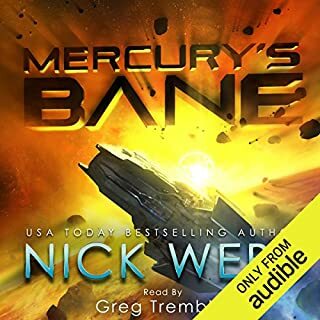 ©2015 Nick Webb (P)2015 Audible, Inc. The opening of this book felt like the author watched the newer Battlestar Galatica and decided to put a little of their own spin on it. Its not a bad book, just extremely obvious. Nick Webb must watch the same TV shows I do. I also try to write, but when I find myself drifting too close to an idea someone has already used, or just flat out copying the idea, I stop and start over. Webb doesn't have that filtering process. He borrows pretty liberally from Battlestar Galactica, Ender's Game and little from Star Trek (A starship engineer named Scott? Sure! I'll just make her female!) before adding any twists and turns to make the story his own. 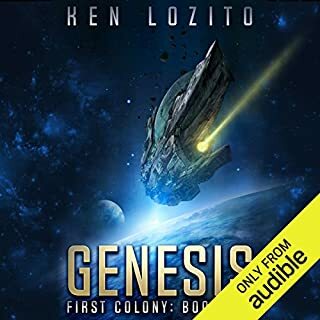 Really, I thought I was listening to an alternate take on BSG for about half the book as I could almost assign book characters to TV characters one to one. The bummer with this take is the "Adama" (Grainger) is not as inspiring. He's just a blow hard who really shouldn't be as good at space navy tactics as *SPOILER* he may turn out to be. Once the "borrowing" of familiar groundwork was done, I like he story itself and may continue with the series if they are on sale. Loved this, being an old school Battlestar Galactica fan I immediately saw the heavy influence in the first part of the book. Old carrier about to be decommissioned, drunk 1st officer, battle hardened stubborn commander, what appears to be a tech heavy race bent on destroying earth, etc. However the story takes a different path than BG, in a very interesting way. Definitely found myself listening for hours on end, I couldn't get enough. 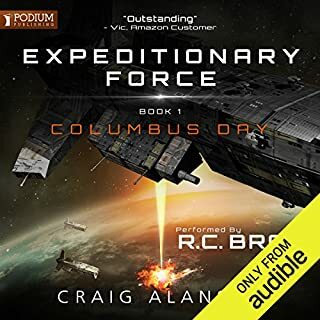 I hope audible and the author add more books in this series soon. Cannot wait to hear the next chapter in this saga! Great performance by the reader as well, highly recommended. 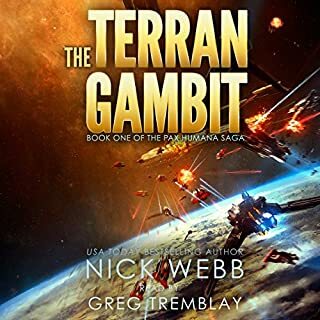 I'm not sure what to think about this one..
Ok first off i just want to say that the beginning of the book felt a lot like Battlestar Galactica. The similarities are too numerous and too close to get over. On the other side I absolutely love Battlestar Galactica. It's one of my favorite stories, so no big deal right? ...kind of. I couldn't stop listening to the audiobook. The performance was excellent. 5 stars. It fit the genre i was looking for perfectly so i had no complaints there. Except for the details. I feel like the similarities to Battlestar Galactica could have been avoided and the story would have felt just as good because it really was just in the details. I mean how many other sci fi stories are at least a little similar to BSG...more than a few. I'm going to keep my eye on the series and see how the second book goes. Not trying to spoil anything but a few of the similarities between this and BSG may not be there in the other books. So it might be something I can look past. Sorry about the rambling folks. Hope this review helps. There's a lot of negativity about this book and i will say it deserves a bit of it, but I think if you can get past it this story could go places. Give it a chance if you're on the fence. Form your own opinion. What made the experience of listening to Constitution the most enjoyable? So a lot has been said about this being a Battlestar Galactica re-hash, and yes similarities exist and some inspiration was probably drawn from it. That said this is a story on its own and the similarities stop at the Captain and EXO's personalities and failings. Well worth the purchase of a SCI-FI Opera Fan. This story has legs and can go places in the seat of you pants suspense and fast paced story line category. Did Greg Tremblay do a good job differentiating all the characters? How? Keep it up Nick Webb- though take some time developing the suspense some more. Delve some into the science and the limitations of fleet - create more intrigue with the government, the Russians and Swarm. Throw in a view curve balls and you have a good recipe. WHY MAKE FRIENDS, WHEN THEY WILL INEVITABLY DISAPPOINT YOU? Ender's Game, Star Trek and even a shout out to War Of The Worlds was included in this book. I read the reviews and knew before a bought this, that the book was not real original. I had no problem with that, as most books are a repeat of old themes. Plus I like all those shows. I wish they would have warned me about how cliché the whole books is. It seemed to me that they took the script from several movies and shows, added all the cliché military lines they could think of, stuck them in a computer and told the computer to write a novel. Nothing happened in the first three hours. A lot of authors, especially for smaller books will start with a battle event or spotting the aliens or anything with some excitement to it. Nick spends three hours setting up his universe. When the action starts the main character proves his cowardliness, by following orders to save some politicians over 30 children. He proves his manhood by making a thinly veiled sarcastic remark to the politician. Did you know that in the future, the cold war will still be going on. That the British will be in space along with the Americans and the Russians. The Chinese, Japanese , French or anyone else will not be in space. At least in the first four hours there was no mention of them. This is not a bad book, nor is it a good book. It just is. For me, I got down on it and just could not like it. Every time the characters spotted off some cliché line or tried to curse, it came out sounding silly to me. I don't know if it was the writing or the narrator, but I thought they sounded like a bunch of seventh graders trying to sound tough. I’m confused. The aliens can travel from the edge of the solar system to the moon in just over an hour, but the time to get from the moon to earth takes, what seems like hours. Sooo very very predictable. Platitudes, cliches, and plot sequences basically lifted from other works made for boredom if it wasn't so laughable. All this smothered in quantum gibberish to try to make it more palatable. Pop corn space opera, I love a good sci-fi story, this was to simple, very quick paced, maybe to fast. Narration was less then desired. Characters are very predicable. Oh well, will try to find something with a little more depth. Read the book and bought the audio book and sorta enjoyed the warm predictable TV script from the last century. 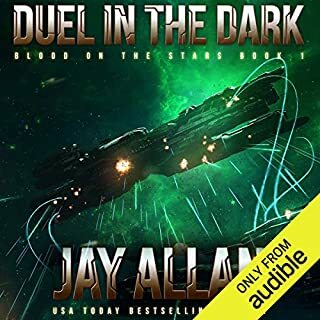 Some strong similarities to the Battlestar Galactica story yet different in everyway that matters, gripped hold of me and would not let me go start to finish. 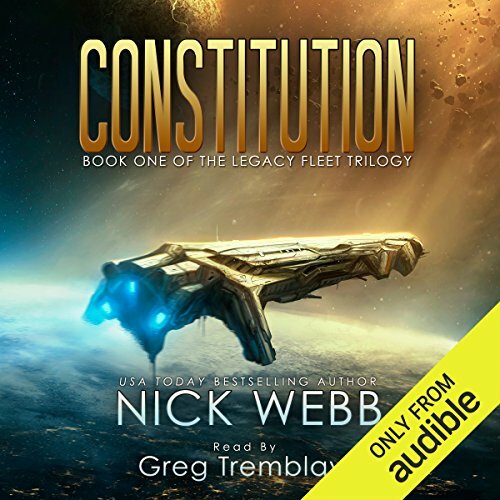 Where does Constitution rank among all the audiobooks you’ve listened to so far? Just finished listening to this book with tears streaming down my face as the climax and finish is very emotional as the writer has embroiled you into the main character of the Constitutions captain. The books finish leaves quite a few questions unanswered which I do hope means that we will be presented with a sequel to this novel, if so cannot wait. Give us more. Really well scripted story arch and performance by Greg Tremblay who managed to bring the characters alive! Trilogy ok but not great! I'll write this for entire trilogy. You can read book 1 through 3. But there was 1 thing : Deus ex machina" like event through out the entire series (yes I don't mean time traveling). Book 1 was ok (few or none ) book 2 (several "deus ex" like events) book 3 "deus ex machina" on the bigger scale (plot impact I mean). You may still like the series itself (story is ok, characters are ok - every thing is ok.... but not great and solutions that "save the day" ... could be more subtly introduce into story or better justified. Characters are very one dimensional and the narrative linear no parallel plot lines unless you count the Russian plot line which is not fleshed out enough. This book took off almost straight from the start and had me hooked within minutes. Cannot wait to get going on the second book. Two factors, having a solid story that I would love to read, and a great performance. What other book might you compare Constitution to, and why? I have to admit getting towards the ending. Where Tim is with Abe in the sick bay. Worrying over the state of his own life and then picking his backside up and not settling for giving it anything but his all. Jessica - the fighter pilot whose thoughts flitted to her comrades and her family. Giving all she had and never letting go of the fact it was still her duty to be there, to die to protect them all. 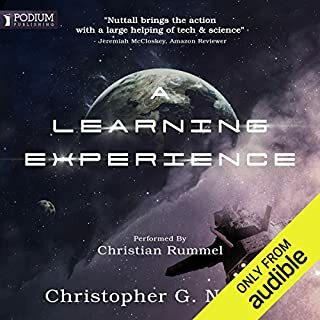 I have to admit, I've been a member of Audible for some many months now, and got a few books on my list, listened to a few part way through and lots of samples. However, this is the first book I've listened to from beginning to end. I'm not an easy pleased reader, or I found listener, the story itself and characters were a hard to track at first, and the chapters too short for me, but the names began to register and the more I listened to this story, the more I fell in love with it. The narration itself was what kept my interest, from the differences in character's speech and traits, it was very easy to listen to and to get involved with. When I anticipated something was going to happen, not only did the performance keep up with it, it kept me guessing till the last minute. Excellent job to both writer and narrator. What's to say really, the first 80% of this story is a 1:1 copy of battlestar galactica but with characters that are less likeable. It was entertaining to listen too, but then i think that's more a credit to what it was copied from then the so called "Authors" skill. Narration was rather flat too but then so where just about all the characters, so not much to work with. Will try and next book, more out of a curiosity to see what story/series he copies for it. To begin with saying that this books rocks it needs a sequel. To end this review by saying that this story needs to be continued.